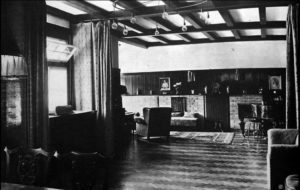 The Steiner House was designed by Adolf Loos in 1910 for the painter Lilly Steiner and her husband Hugo. It clearly shows the main principle of Loos: design must be determined by function. 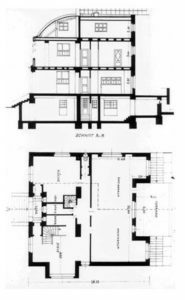 The Steiner House showcases Loos’s ability to work with external limitations of an architectural site, as there were shape restrictions and planning codes to consider. 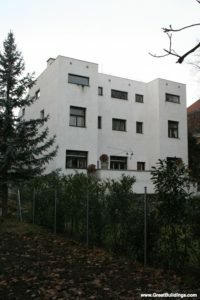 The Steiner house became a highly influential example of modern architecture; it played a significant role in establishing Loos’ reputation as a modern architect to the audience outside of the Viennese community, and became an obligatory reference for architects during the 1920s and 30s. Almost all of the literature of the Modern Movement has reproduced the garden façade as an indisputable example of radical rationalist modern architecture. For Loos the exterior was the public side of the house; that is the reason for the bare wall surfaces. 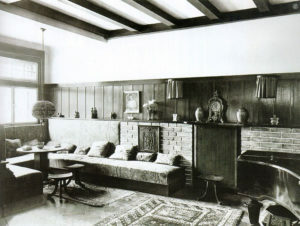 The interior was the private side and reflected the owner’s personal taste. As some critics have stated, the house reflects a ‘classicism married to Anglo-Saxon domesticity in a search for spatial continuity’. 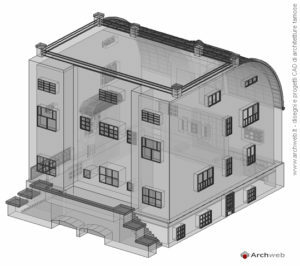 Steiner House’s front view, 3D model. 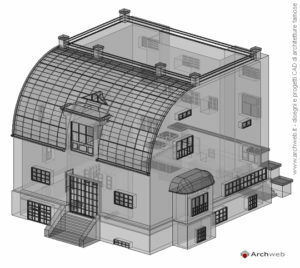 Steiner House’s back view, 3D model. 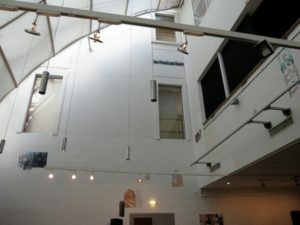 At the time, only one floor above street level was allowed. 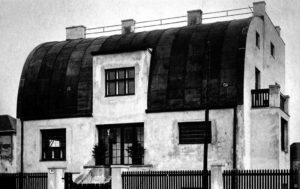 Loos’ solution was an arched tin roof which contains two additional floors giving the structure its somewhat austere and futuristic look. 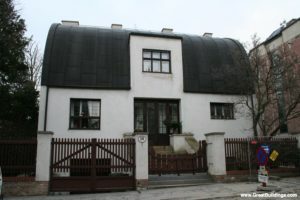 This house is a manifestation of Ornament and Crime written in 1908, in which he repudiated the florid style of the Vienna Secession, the Austrian version of Art Nouveau. The house shows the architectural principes of Loos, a design to exclude all tools of arts to emphasize function. The front garden has been an indisputable space of radical rationalism in the modern architecture. Each volume has the size according to its own role, until all the internal spaces were under a single roof plane. Carried out in this way a remarkable spatial economy. Symmetry, the total lack of ornamentation defined the building. An architecture based on the economy and the rigour of the function. 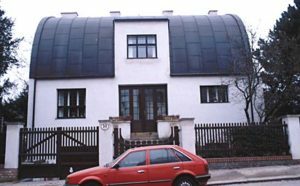 The architect added the building to the gap between the street and the garden, with his hand on the four floors and in relation to the roof of the only permit on the side of the road by a curved roof. Any combination of interior spaces should be based on the juxtaposition of large and small spaces, while maintaining a single roof. The side walls are different environments with different heights. The front garden, however, is neat and composed with a classical and symmetrical order, surmounted by a semicircular roof covered in metal and so articulated Loos manages the transition between the front garden and the heights. The façade of the rear windows and the irregular arrangement of various dimensions, which reflect their different domestic environments in dimensions and heights, which are a reflection of the principle of “raumplan”, Loos concept applied in many of his works and which is thinking about space , the space intuitively understood as a consequence of a free composition of volumes and plans. The coupling of different heights is evident in the front part through the holes, arranged asymmetrically. Covered with cement and wood, to adapt to the climatic conditions of central Europe. Roofs in sheet metal, concrete walls and bricks. It rejects the glass walls of exemplary exhibitionism, internal parking. Cubic flat concrete house roof, windows and cut in front garden. The main façade is adapted to the standards and coverage with a semibóveda sheet. It is located in St. Veit-Gasse 10 St, Vienna, Austria.